Motor scooter rides around Buffalo feel liberating for Donna and Dennis McGuire. Imagine what it must feel like for their dogs — Brad and Nugget — who ride with them in pet carriers mounted on the couple's bikes. The quartet may be spotted zipping through Buffalo on almost any nice day. And in the year or so that they've been riding, tons of passers-by have asked for a picture, honked or waved back. The dogs sure put a lot of smiles on peoples' faces. 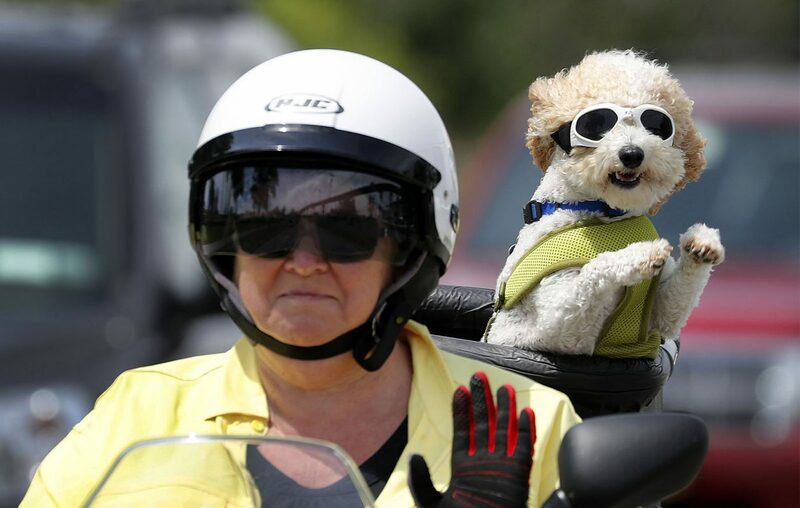 Brad, a 1-year-old Bichon Frise and poodle mix, often stands up and flails his paws from his PoochPod, a pet carrier that can be mounted on bikes, scooters and the like. Nugget, a 3-year-old silky terrier, likes to look from side to side so she doesn't miss a thing. "They love the daylights out of it," Donna, 64, said of the duo. "We can't get out of this house without them trying to go with us." When the family heads out, each dog wears a collar tethered to the pod, along with a vest-style harness. They wear made-for-canines goggles, too, to protect their eyes from the wind. But they draw the line with matching helmets. Despite never thinking she'd ever be interested, Donna and Dennis, 68, obtained motorcycle licenses last year after seeing a few other couples riding around. They each got a motor scooter — hers is red, his is blue — and decided they wanted to include their pets, too. At first, Donna said, the dogs were afraid of the pods. Once Dennis fixed the pods onto their bikes and the four of them headed out, though, they were hooked. All of them. "Ever since," Donna said, "they go nuts." "It's like the first time every time," she said. Brad rides on Donna's scooter, Nugget on Dennis'. Donna estimates she and her husband have taken the dogs along with them at least 75 times this year. Of course, there are many more trips ahead. "It just feels like freedom," she said.